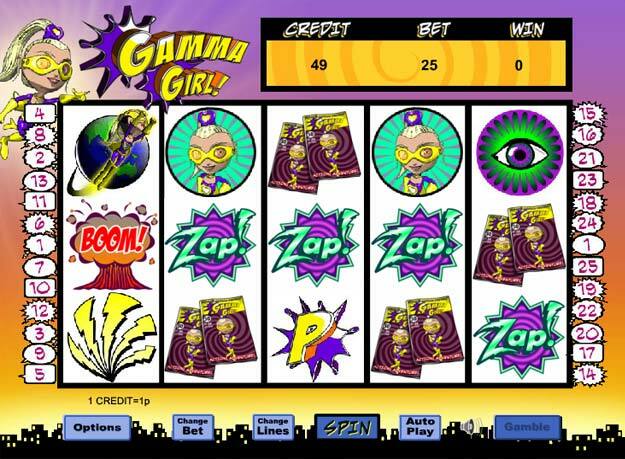 Meet Gamma Girl, a peroxide female superhero who loves dishing out electric charged free spins as a reward for playing her slots online 5 reel. Zap through reel after reel until you get to the hi-lo bonus game in which you can multiply your rewards. Gamma Girl’s high-octane adventure is not one to miss. Eyecon has been surprising players with some of the best slot experiences when it comes to graphics, gameplay and prizes. The company prides itself on its innovative take on slot games, committing to making sure each player can find a game that will suit their needs, and that is one of the reasons why Eyecon is in the lead of the online casino industry. In Gamma Girl, you have the chance to go save the world alongside this popular comic book hero, and then collect all the rewards. To find out more about Easy Slots promotions click here. This slot game perfectly utilizes the graphics to offer you an experience very close to the real-life comic books so many people love. The colours are beautifully chosen to create the thrilling universe where all the action happens, once Gamma Girl arrives to beat the forces of evil. Have you ever fancied yourself a superhero? Now is your chance to see how right you are for the job, with the help of a real expert in saving the world, and in a place where anything in possible. Grab your superhero cape to play Gamma Girl! It has 5 reels and 25 paylines that will keep you on edge all throughout. Immerse yourself into the action-packed atmosphere and start winning big, while enjoying the authentic comic book graphics that this slot game has to offer. You can adjust the number of active paylines and can change your bet at any time before pressing the spin button. There is also a Gamble feature you can use whenever you need a flash of adrenaline, and you have the chance of winning double or nothing. This thrilling slot experience has a variety of carefully designed symbols that represent elements of the classic Gamma Girl comics: colourful exclamations such “Zap!” and “Boom!”, explosions and action figures. The Gamma Girl icon is, as expected, the Wild symbol in this game, and she substitutes any other symbol besides the Scatter, in order to form more winning lines, much to your own delight. Moreover, if you spin 3 or more of this symbol, an extra feature is activated, called the Gamma Feature. Then, you have to choose between 12 safes, in order to find a matching pair of their insides and multiply your prizes. The fire symbol is the scatter in this slot game and if you spin 3 or more of them, you activate a Bonus round, where you get to be the hero, by extinguishing fires and then being rewarded with Multipliers and Free Games. This 5-reel game has plenty of potential for you to amass big winnings, all while attempting to save the world from evil. Now, what could be more exciting than that? Gamma Girl successfully combines comic book heroes with a slot experience that is close to unforgettable, due to its features and top-quality graphics. This slot game is especially entertaining for superhero fans, but ultimately it will satisfy next to any player, as long as they have a taste for action and easy wins. Another great game is the warriors slot. To discover more Easy slot games Click here.